You can access results feedback on a course-by-course basis within Project Results or search for feedback for all projects and courses within Results Feedback under the Results tab. Use project, course or hierarchy level search criteria to search for feedback. Select New Only option to view only new feedback. View list administrator’s and instructor’s feedback for course(s) based on your search criteria. Click on the Reply link to respond to feedback (4000 character limit, with spaces). Click Export to PDF to export the feedback to PDF. 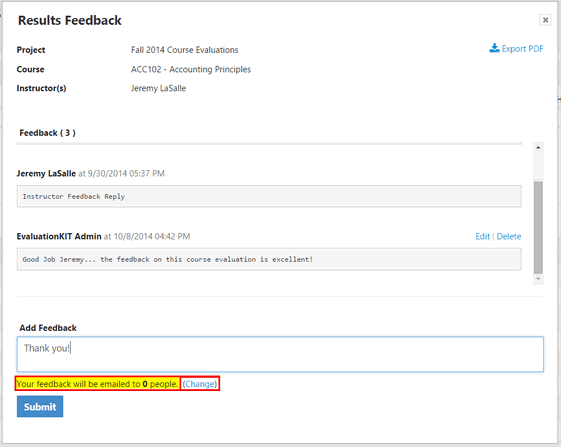 Click on Report icon, located to the right of the respective course under the Report column. View administrator’s and instructor’s feedback on this course. Type feedback into text box (4000 character limit, with spaces). Before clicking Submit, click on Change link next to Your feedback will be emailed to X people. 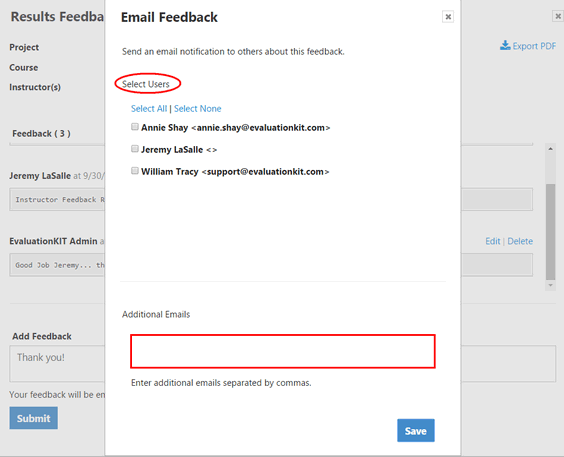 Select users to Email feedback to or add additional Emails in text box below. Your feedback will be emailed to X people will be updated. Feedback will appear in feedback window with user’s name and time stamp.